Inspire us Tuesdays - Thanksgiving Decor! Inspire us Tuesdays – Thanksgiving Decor! Welcome to Inspire Us Tuesday #16! Last week our party had 113 incredible links submitted! Our tails wag with delight each week when we see that you have returned to link up and share your inspirational posts with us! We are really excited about Thanksgiving this year! The smells, the nibbles of great food we may be lucky enough to savor and the time spent with our loved ones… what could be better for 2 cute little dogs? We would like to share 6 Thanksgiving Safety Tips for Dogs with you. Please take a moment to read it and help keep your furry friends safe this holiday. With our excitement over Thanksgiving we could not resist being inspired by these posts. These creative and cute Do a Dot Printables would be a great way to distract the kids from all of the great aromas on Thanksgiving Day as the feast is cooking. Thanksgiving isn’t complete without turkey art. These Paper Plate Turkeys are fantastic! Another way to keep the kids happily busy in a festive way! We need a few more adorable Thanksgiving decorations, so we are hoping to enlist the help of someone with thumbs to make these Pilgrim and Native American Clay Pots. If you are on a Paleo Diet don’t let Thanksgiving Dinner get you down. Confessions of an Overworked Mom has Butter Nut Squash with Maple recipe that is a perfect side for you! If you aren’t making Thanksgiving this year at your house this is a perfect fall dish! Intoxicated on Life has a Grain Free, Sugar Free Gingersnap recipe that would be perfect o have on hand for when you come inside from playing out in the cold and snow. We adore these printable cards for any Thanksgiving spread from Home Cooking Memories. They could do double as place cards as well. If you were featured this week grab a button! We made sure our button was special and different so that you would be happy to grab it and show it off! Now onto the Inspire Us Tuesdays party! Link up to 3 posts. Your recipes, crafts and household tips are welcome. Please no giveaways, etsy shops or links to anything you are selling. We are looking for things that inspire you and will inspire our readers, fans, and friends at Inspire us Tuesdays. You are welcome to link up anything that you find inspiring and share worthy. 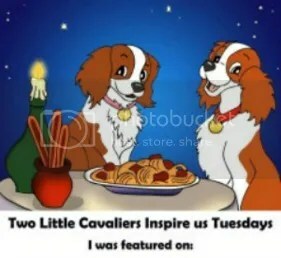 Please note that by linking up to Inspire Us Tuesday you are granting us Davinia and Indiana the Two Little Cavaliers and our assistants (we don’t have thumbs so it gets hard to type), permission to feature your post on our social media accounts or on our Blog or in our newsletter if your share really inspires us. Speaking of our newsletter…. We would love to send you a weekly party newsletter so you never forget to hop over and share something inspirational with us. If we share your post we will credit you and link back directing our readers, fans, followers, and their people to check out your blog. We can’t wait to see what you have to share with us this week! Don’t forget to visit the other bloggers as you are linking up. That is what makes a party so much fun! Oh and make sure to spread the word and tell your friends. You never know who is looking for a little inspiration or has something special they would like to share with others. Those Thanksgiving clay pots are cute! Thank you for the party. Thanks so much for sharing my recipe. Off to check out the others. Sharing! Thank you so much for including two of our posts in your round up. There is so much great inspiration here! 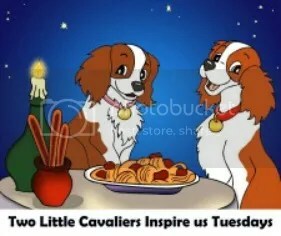 By taking advantage of these offers Two Little Cavaliers will receive a small free. This does not in any fashion increase the cost to you.